At the request of my clients, I am now offering charcoal briquettes for your practices! 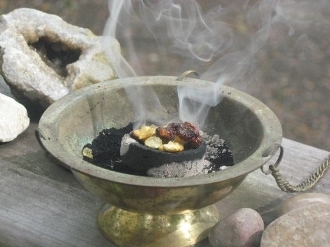 I sell many resin incense, powders, and herbal mixes that must be burned on charcoal as they are pure, natural mixes that are free from igniting agents such as saltpetre and sulphur. These are the best and purest incenses for offerings and rituals. Stick and cone incenses are created from synthetic scents, chemicals, and saltpetre. Saltpetre is fine when you KNOW you're using it but it is also corresponds to Mars. Mars may not be an aspect you care to invoke in the delicate work and balance of your particular practice. You will receive one roll of 10 disks.